Drawing a place sometimes leads to learning its dark secrets. This is not my best drawing, but the story about this place is worth telling. 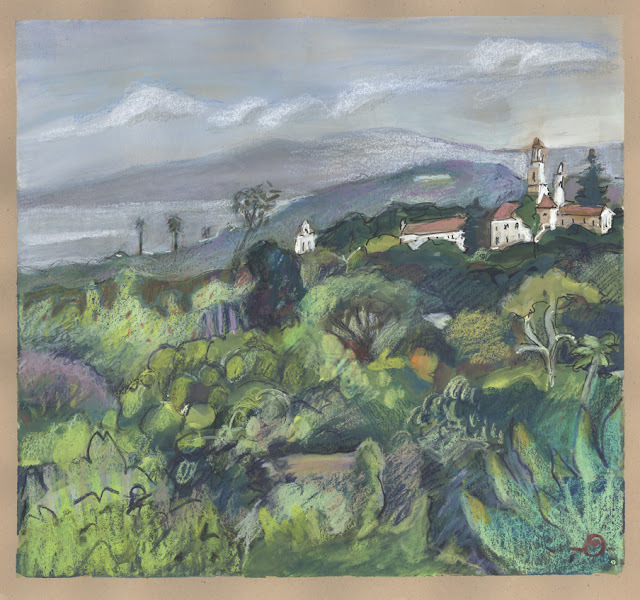 St. Anthony’s Seminary, the white Spanish-style building with tile roof and bell towers is a landmark in this idyllic Central Coast California city. With relatives here, I visit yearly. Last year, I drew the seminary in another panorama. This year the seminary dominated the sweeping view from the house we rented. Which prompted my husband and I to find out some history about the place. It was built in 1899 by the Franciscans. The last class of seminarians—boys who came from up and down the US West Coast—graduated in 1987. It is no longer a seminary or connected to the Catholic Archdiocese of Los Angeles. Now owned by a nonreligious charitable trust, recently designated an architecturally significant, historic site by the City, it houses an independent private kindergarten through twelfth grade school. Nothing ugly about any of that, you say. Here’s the ugly side: shame and infamy surround this landmark. For 20 to 25 years, bridging the 1960s, hundreds of boys were sexually molested by priests and monks here. The higher ups in the archdiocese, who kept secret files of the abuse perpetrated by their own, did nothing to stop it. In 1992, revelations of abuse were finally uncovered. None of the priests were punished for their egregious misdeeds; the statute of limitation had passed. The archdiocese and the Church have not fully acknowledged their complicity. The climate of repression harbored by the Catholic Church still continues. The boys—now middle aged men—are left to sort out the personal damage from their abuse. This gleaming white edifice will always be associated with this gaping wound.